"Tamar has a power in her performance that is completely joyful and transportive. Her singing and dancing are deeply naturalistic and she’s transfixed me with her capacity to unravel a song. I’m a huge admirer." "Tamar has spent a lifetime mastering beautiful vocal traditions from around the world, only to arrive at a sound that is uniquely her own. She transcends genre, geography, and language. She is Canada’s own pan global diva." 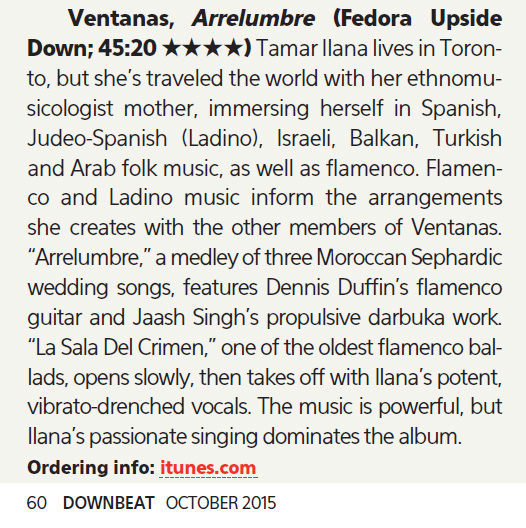 "Tamar Ilana & Ventanas could go head to head with any punk band." "Tamar's generosity of spirit and mastery of her music created a wave of infectious, unstoppable momentum on stage. Tamar empowered all the musicians around her to take chances and to elevate the performance. I felt lucky to be one of those musicians. Tamar’s command of her voice and deep understanding of the songs challenged me to find my own truth in the music. I still draw from that experience as a reminder of how sharing music with an open heart can bring so much hope. Tamar was the catalyst for that hope." "Captivating. At once surprising and enchanting. Both Sellick and Ilana are masters of their respective arts, and the two have an intense musical chemistry." "Music lovers sat enraptured by her Sephardic love songs..."
"Tamar Ilana’s voice sails overhead...[her] honeyed vocals providing a tender contrast..."
"...gorgeous flamenco singing by Tamar Ilana..."
"Ilana is an excellent singer..."
"...the haunting voices of singers Lubana Al Quntar and Tamar Ilana..."